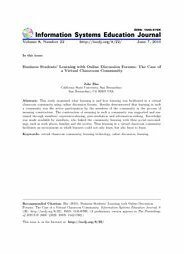 Abstract: This study examined what learning is and how learning was facilitated in a virtual classroom community using online discussion forums. Results demonstrated that learning in such a community was the active participation by the members of the community in the process of meaning construction. The construction of meaning in such a community was supported and sustained through members’ experience-sharing, peer-mediation and information-seeking. Knowledge was made available by members, who linked the community learning with their social surroundings, such as work places, families and the society. Thus learning in a virtual classroom community facilitates an environment in which learners could not only learn, but also learn to learn.